For the most part, the names of the men and women who create the gorgeous pageant of Mardi Gras are unknown to the masses of people who line the streets each year to beg for beads as the parades pass by. There is a tendency, perhaps, to take the floats and the costumes worn by krewe members for granted. But without the skill and imagination of the carnival designers, there would be no magic to Mardi Gras. This exhibit reveals a bit of the artistry behind the making of one of the greatest free shows on earth. Bror Anders Wikstrom designed the carnival parades of the Krewe of Proteus from 1900 to 1910. A native of Sweden, Wikstrom ran away to sea at a young age and spent a dozen years as a sailor. When he returned from his travels, he studied at the Royal Academy of Art in Stockholm and later in Paris before setting out to make his fortune in America. 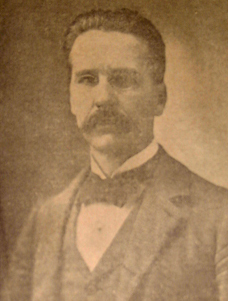 In 1883 Wikstrom came to New Orleans. His entrée to the world of carnival came when he began to work as assistant to Rex's float and costume designer Charles Briton. When Briton died, Wikstrom succeeded him and continued to design for Rex, and later for Proteus, until his death in 1909. The Louisiana Division has Wikstrom's original water color float designs for the 1906, 1907, and 1909 Proteus parades, as well as a number of his costume designs. These drawings were given to NOPL by Leda Plauche, who began to design for Proteus in 1923, along with a large number of her own designs. Mrs. Plauche apparently had the Wikstrom drawings in her possession and probably used some of them as inspiration for her own designs. The bulk of Wikstrom's Proteus designs are housed at Tulane University. Unfortunately, very few of his Rex designs have survived. The online exhibit displays the 18 surviving drawings from the 1909 Proteus parade, Romances of Wales (there would originally have been 20 designs; the drawings for floats No. 5 and 11 have not survived). The exhibit on view in the Louisiana Division displays 11 of the drawings.